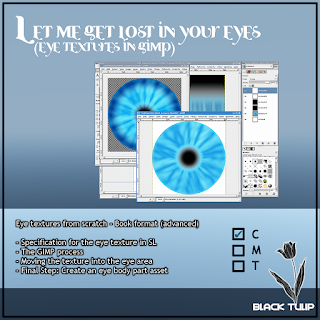 - What is animating in the world of SL? 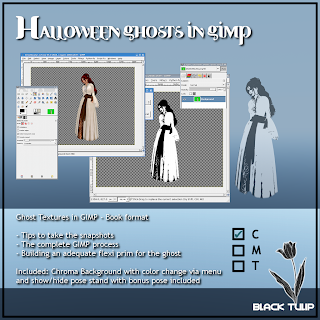 - What file type does SL expect for animations? - What does FPS mean? Are SL animations limited in time? - Uploading your animations to SL: The parameters. Priority. 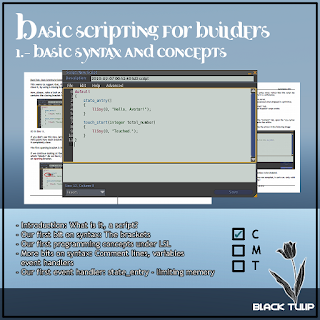 "Basic Scripting for Builders" is the little brother of "Speaking LSL". Oriented to builders, it works at a very slow pace all the required concepts to understand scripts and know how to modify them. 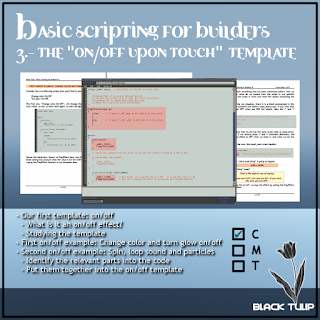 This third book covers how to work with an On/Off template: a fully explained script that allows us to create just one script controlling several effects to activate/deactivate upon touch. Slow paced, all the examples are fully commented. This first book covers the basic structure of a script, shows how to create scripts, and answers to a lot of questions that even some scripters don't know about. In layman terms, this book is a perfect introduction to scripting to any person that has ever written a script, or a program, at all. 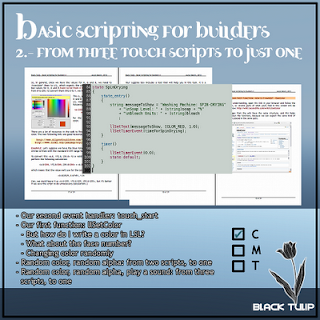 This second book covers how to create scripts that react to touches, how to put two actions on touch, and how to put together several scripts on touch, so you have the same actions in just one. This class is in book format, a wearable HUD with all the information, tips and graphics. Class in a box: Music! 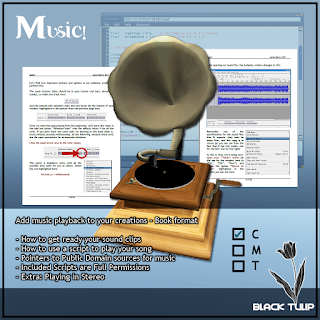 Avalaible at SL Marketplace: Class in a box: Music! Stereo music: is is possible? 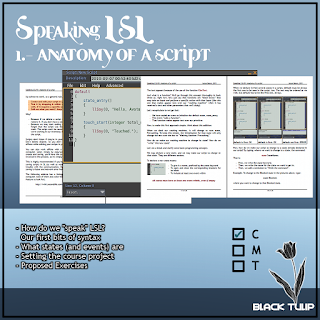 This first book for the "Speaking LSL" course introduces what a script it, what its basic elements are and how to build them, through an example that represents a daily item. The whole course is in book format, a wearable HUD with all the information, tips and graphics. 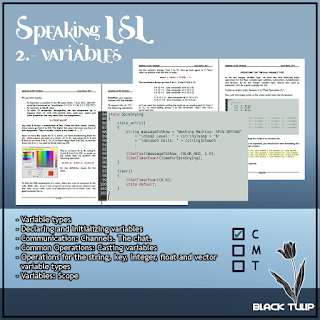 This second book for the "Speaking LSL" course covers completely the "variables" topic through extensive explanations and multiple examples, continuing working also with the "Washing Machine" project. 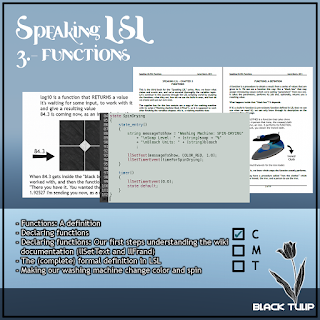 This third book for the "Speaking LSL" course continues by explaining everything we need to know about functions, giving the first directions to understand the wiki definitions, covering some common functions and applying all this knowledge to the washing machine project. 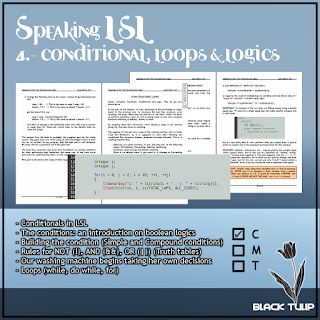 Book four for the "Speaking LSL" course covers the always tough topic about logics, explaining everything we need to know for them, and the flow structores: conditional and loops. What do you really mean with "TRUE"? Knowing when your condition is TRUE. 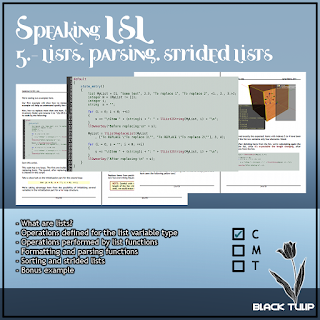 Book five for the "Speaking LSL" course covers in detail the list variable type, which allows us to manipulate complex data structures. All the related functions, tips and considerations are explained here. Total of items for a list. Numbering items. Are lists limited in size? Memory considerations. How do I retrieve the item located in a certain position? Reading notecards is a process widely required as soon as we begin our career as professional scripters. Configuration notecards aren't but the norm in basically any application we may think of. This book is broken down in four sections. 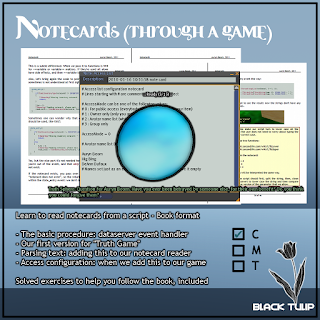 The first one will explain you how the process of reading a notecard is, through a simple example.